353/365 I bought this for myself, originally uploaded by phlegmmy. Not the grandkids. The artwork is stunning. It won the Caldecott Medal this year as well as the Coretta Scot King Award. It is a beautiful book. I did share it with Diesel & Feezle. :-) I have a whole small collection of artsy kids books that the grandkids have never even seen...Bad Oma. What's the name of the book? Love the lion on the front and would like to see all of the pretty pictures! It's called "The Lion and TheMouse" based on the Aesop's fable and there are no words in the story either. Once the illustrator had done the drawings he felt there was no need for the words of the story. It's interesting because he is dyslexic, but that was not his intention. 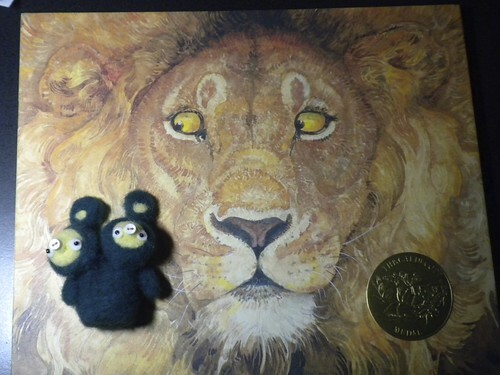 The back cover has the mouse on it and that is what the lion is looking at. It's really brilliant--all the African animals in the drawings are stunning.